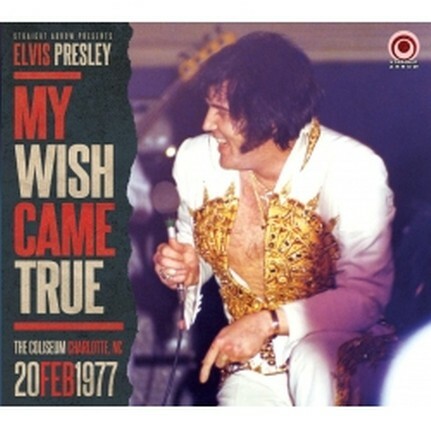 Our second release is titled „My Wish Came True“. It was the 1st tour of 1977 and in spite of his unhealthy look, Elvis was in solid voice - especially near the end of the tour. February 20 is one of best shows of the tour and it marked the first time that Elvis attempted his recent single „Moody Blue“. Our release has been taken directly from a 1st generation copy of an original audience recorded master cassette tape, as recorded by Claude Baker (aka Crazy Canuck), who passed away in September 2016. Claude attended, and recorded, all of Elvis' shows during the February tour of 1977. Portions of the Charlotte concert were previously released from a soundboard tape on the official 'Follow That Dream' label, but this show has never been available on CD in its entirety before. Note: This is the very last audience-recorded show from the February 1977 tour that is still unreleased. The sound quality is very good. There are highlights a-plenty, including a soulful 'You Gave Me A Mountain', strong versions of 'My Way' and 'How Great Thou Art', and a truly gorgeous 'Unchained Melody'. As usual, this release is presented in a de-luxe 6-panel digipak, with a collection of photos taken in Charlotte, February 20th, 1977 and two local press reviews. With special thanks to our dear friend, the late Bob Heis. 01. Introduction: Also Sprach Zarathustra - 02. C. C. Rider - 03. I Got A Woman / Amen - 04. Love Me - 05. Fairytale - 06. You Gave Me A Mountain - 07. Jailhouse Rock - 08. O Sole Mio (Sherrill Nielsen) / It's Now Or Never - 09. Little Sister - 10. (Let Me Be Your) Teddy Bear/Don't Be Cruel - 11. My Way - 12. Moody Blue (excerpt) - 13. How Great Thou Art - 14. Introductions of singers, musicians, orchestra - 15. Early Mornin' Rain - 16. What'd I Say - 17. Johnny B. Goode - 18. Drum Solo (Ronnie Tutt) - 19. Bass Solo #1 (Blues - Jerry Scheff) - 20. Bass Solo #2 (Battle Of New Orleans - Jerry Scheff) - 21. Piano Solo (Tony Brown) - 22. Love Letters - 23. School Day - 24. Hurt (with reprise) - 25. Hound Dog - 26. My Wish Came True (excerpt) - 27. Unchained Melody (with false start) - 28. Can't Help Falling In Love - 29. Closing Vamp / Announcements.